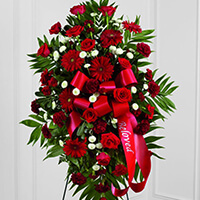 Provide comfort for the family of Everta Heister with a meaningful gesture of sympathy. 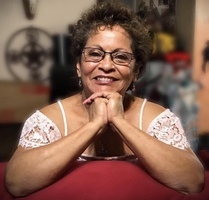 Everta Esmeralda Heister of Elm Mott passed away December 24, 2018 at her home, surrounded by her loved ones after her battle with cancer. Services will be at 1 pm Saturday, Dec. 27th at the OakCrest Funeral Home Chapel, 4520 Bosque Boulevard, Waco, with chaplain Charles Howard of Chalk Bluff officiating. A memorial video prepared by OakCrest Funeral Home honoring her life will be shown during the service. A graveside service will follow at Oakwood Cemetery. Everta was born August 24, 1944 in Santa Rosa to George Cavazos and Manuela Garza. She attended school in Itasca. She married, and moved to West in 1965 and became a housewife. She moved to the Mojave Desert in 1967 for a few years. In 1968, she moved from Rockport to Aurora, Illinois and got a job with Western Electric in 1971. She would make small toy soldiers while working there. After her stint in Illinois, she moved to Bellmead where her children attended school and she got a job with Kirsch Mini Blind company for 20 years until her retirement in 2001. Here, she met the love of her life and now husband, David Heister. They were married November 18, 2005, residing in Elm Mott. In her younger years, she loved music and dancing. Her hobbies included fishing, gardening, cooking, sewing, taking care of here grandkids and her love for raising chickens. She is survived by her husband, David Heister of Elm Mott; her daughters, Velia Goldsmith and husband Troy Sr., of Crawford, Dora Solis of Elm Mott and Vicki Mackie of Crawford; Step Children, Rachel Heister of Waco, and Justin Heister and wife Miranda, of Waco. Also surviving are her grandchildren, Mariah Goldsmith, Hayley Mackie, Kendal Mackie, Troy Goldsmith Jr., Madison Samford, and Rudy and Rory Gallegos; brothers, Joe Cavazos and wife Esther, of Raymondsville. and Pete Cavazos and wife Mary, of Hewitt; sister, Alice Cavazos of Bellmead; and numerous nieces, nephews and cousins. She is preceded in death by her mother and father, George and Manuela Cavazos; sisters, Lynn Robertson, Adela Lara, Josie Ramos, Sally Leuschner and Mary Perez; and her brother, Manuel Cavazos. 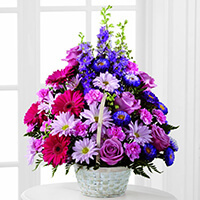 To send flowers in memory of Everta Esmeralda Heister, please visit our Heartfelt Sympathies Store. We encourage you to share your most beloved memories of Everta here, so that the family and other loved ones can always see it. You can upload cherished photographs, or share your favorite stories, and can even comment on those shared by others. Daisy Yepez and Gingerbread Family - Jodie, Craig, Dawn & all kids have sent flowers to the family of Everta Esmeralda Heister. I am sorry for your loss, I will keep your family in my thoughts during this difficult time. May your mom rest in peace forever and ever. Daisy Yepez purchased the The FTD Pastel Peace Basket for the family of Everta Heister. No words can make this easier but know we are all thinking of each of you today, and the days to come, we send big hugs and all our love. Gingerbread Family - Jodie, Craig, Dawn & all kids purchased the The FTD Treasured Memories Standing Spray for the family of Everta Heister.